With Thanksgiving just about here and the holidays quickly approaching, now is the time to start putting together holiday care packages to send to your military family and friends who are deployed overseas. Care packages are a wonderful way to lift the spirits of a service member during this time of year. A military care package filled with personal messages and a few small comforts from home can help boost morale and remind your recipient of how much they are loved and appreciated. Not sure where to start or need some seasonal inspiration? Here are some tips that can help you create and send the perfect military care package for the holidays. The USPS offers a free “Military Care Kit” and a military discount! Call 800-610-8734 to order the kit, or visit the USPS website for details as well as guidelines on how to address the package. The USPS also has a military mailing discount: The USPS offers its largest Priority Mail Flat Rate Box at a special discounted price of $17.35 if mailed to an APO/FPO/DPO (Air/Army Post Office/Fleet Post Office/Diplomatic Post Office) destination. That’s a $1.50 per box discount. Here’s where the fun begins—decorating and filling your holiday care package! Think of creative ways to express yourself and your love for your special service member. When making a military holiday care package, think of creative ways to express yourself and your love for your special service member. Why send a boring box? Surprise your care package recipient by wrapping the interior of the box with colorful wrapping paper. This military mom shares tips on how to make your next care package look amazing from the inside out. All I Want For Christmas is You package – This romantic care package includes “All I Want For Christmas Is You” on the inside of the box flaps and is embellished with festive garland. Christmas Tree package – The inside of this box was turned into a Christmas tree with construction paper. Grinch package – Featuring the words “The Grinch Stole Christmas and Brought it to You,” this care package would make anyone smile. Did you know that you can also send delicious homemade sweet treats baked in mason jars? Click here for dessert in a jar recipes. Be careful not to overfill your package and be sure to leave out items that are restricted or prohibited by the country. Read our blog, Military Care Packages – Dos and Don’ts for additional things you should keep in mind when putting together your military holiday care package. Use scrap wrapping paper or garland to fill in any gaps you may have after filling the box. This will prevent items from moving around during transit. 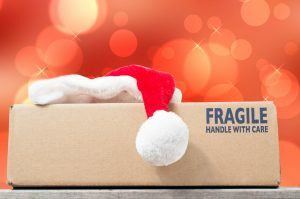 Ensure that your holiday care package arrives on time. The United States Postal Service website has updated its recommended mailing dates for the 2017 holiday season. Visit the USPS website for mail deadlines to military APO/FPO/DPO addresses overseas. The holidays can be difficult for military families who are separated by deployment. A care package is a thoughtful way to send a loved one cheer and a little piece of home.